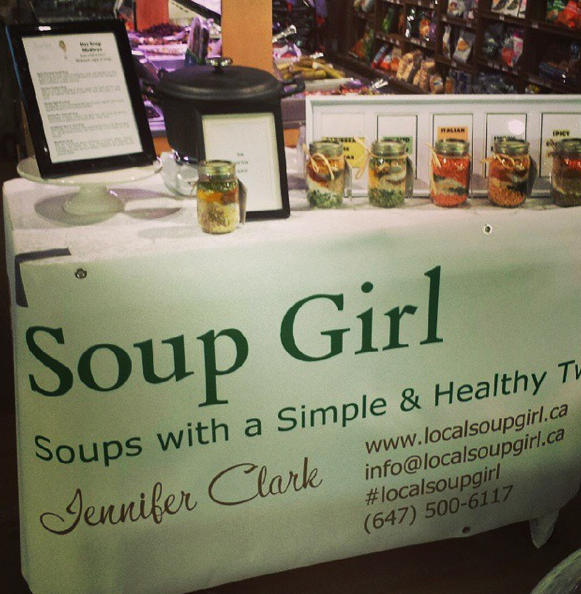 Market goers to the Orangeville, Inglewood, Erin and Brampton Farmers’ Markets are eagerly buying Soup Girl products at their weekly markets. 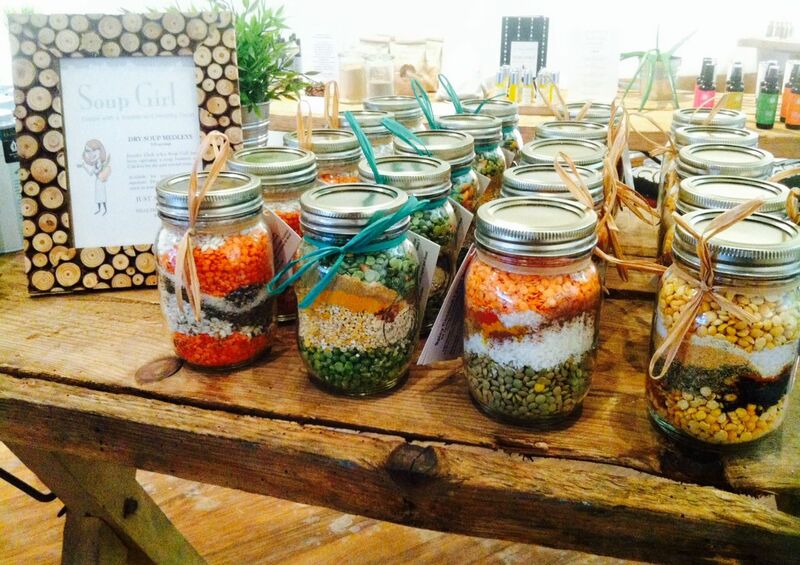 Retailers across the Golden Horseshoe and beyond are now carrying Soup Girl products. Let’s meet the force behind this flourishing food business: Jennifer Clark. 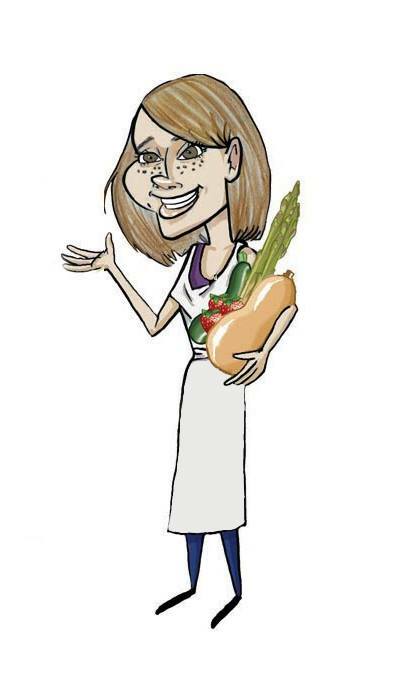 In 2008, Jennifer was hired by the Caledon Countryside Alliance to help start up a local food program, Eat Local Caledon. The program worked on a variety of notable initiatives: a community farmers’ market, school gardens, cooking classes, and other local food initiatives that connected farmers and chefs. Many inspiring, nourishing outcomes have grown from Eat Local Caledon and the farmers’ market, one of them being Soup Girl. What began as a casual hobby has now grown into a business that is thriving in Caledon. As Jennifer became increasingly immersed in cooking, she began catering and making soups. Then, in an effort to amplify offerings at the Inglewood Farmers’ Market, she brought her locally-inspired, artisanal soups to the market to add another vendor’s booth. Jennifer’s soup promptly sold out. It’s appropriate to highlight Soup Girl at the start of 2016, the International Year of Pulses, as Jennifer’s soups are hearty with Canadian lentils and split peas (mostly from the prairies). With just the addition of herbs, spices and organic sea salt, the product is nothing but healthy, simple ingredients that Jennifer says you would find in your own kitchen cupboard. It’s a convenient product to make on-the-go that allows you to still eat healthy (high in protein, fibre and iron); just add water, and voila! Packed and layered in a glass jar, it can also act as beautiful decorative item on your shelf until you’re ready for dinner. Jennifer says she is continually playing around with the flavours and ingredients to keep her product fresh and at its best. The website currently lists these flavourful choices: spicy coconut lentil, curried cashew, smoky split pea, Italian rice and lentil, Caribbean rice n’ peas, the detox soup, Moroccan lentil, and za’atar lentil. The pearl barley is from Ontario, and she is looking into more Ontario ingredients for the herbs and spices. In 2016, Jennifer also plans to launch an organic line of her soup using organic lentils and grains: Soup Girl O. The Soup Girl venture began at home, but now with its growing success, Jennifer rents out a commercial kitchen in Palgrave, using it about 8 times a month. With the product now in stores and at events, this provides her with not only the needed space, but also to comply with public health requirements – cooking in an approved commercial kitchen (a Peel Health inspected facility). The relationships Jennifer had previously established through her work with Eat Local Caledon were key to her business, and the support she received is something she is quick to acknowledge. Jennifer had already fostered supportive relationships with farmers, retailers, other organizers and the managers of the kitchen she rents. Her knowledge of the local businesses, such as Spirit Tree and Downeys, allowed her to get her product in local stores — all support she had certainly deserved. This paved the way for a strong, fast launch. Her family has also been very supportive, bringing product to the markets and stores when Jennifer is not available. As the product expanded to areas in Toronto and the GTA, Jennifer emphasizes the importance in continuing to build relationships, and how face-to-face connections are fundamental. Customer service and product quality are at the top of her list. 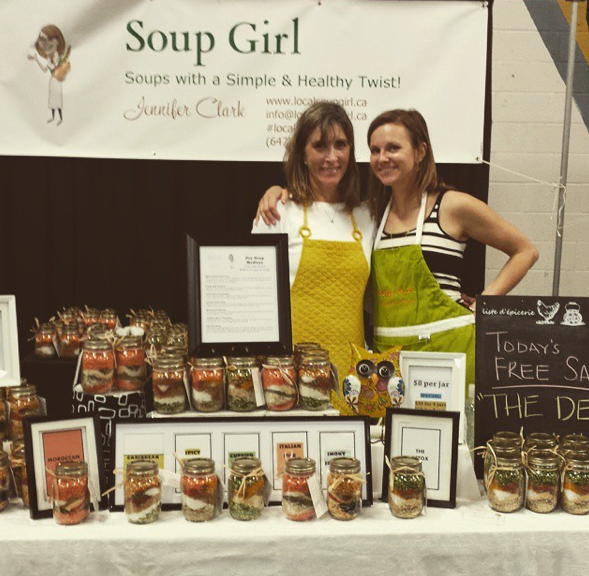 Soup Girl sales are split fairly evenly between retailers and people who buy direct from her at events and online, and in both cases customer service is paramount. But being proud of your product and maintaining quality is just as important. “A high quality product will sell itself,” she adds. A piece of advice? Jennifer stresses that new food businesses should make it work for the retailer, who are really customers as well. “After all, they are putting your product on their shelves,” Jennifer says, “offer samples, provide all the information you can, and be flexible.” Establishing these relationships, and understanding that each store is different, allows for a mutually supportive connection to grow. For Jennifer, it’s also important to give back to the community. 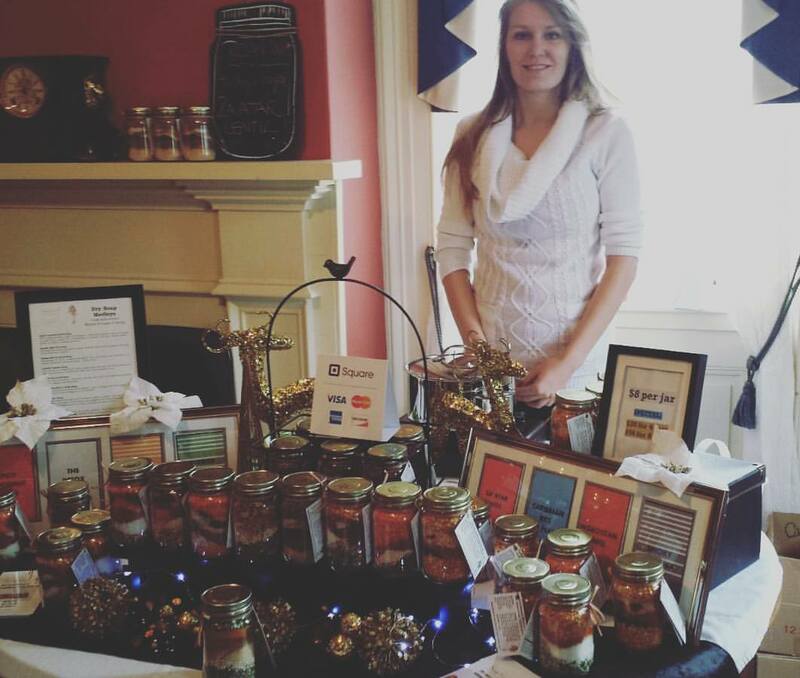 This past summer, she had 15% of her sales from 4 local farmers’ markets donated to Peel Children’s Centre. The day before we spoke with Jennifer, she had just delivered soup to a fundraising drive at their Christmas party, with 20% of the sales going back to the centre. And the next night, she was donating a case of soup to another fundraiser. Perhaps you could call her Soup-er Girl. A healthy stirring of the community pot… a farmers’ market inspires a new vendor, the vendor grows into a successful new business in the community, and the success allows for the business to give back to the community that supported the new vendor in the first place. The best cyclical win-win scenarios are surely ones that involve good food!